Dr. Randy Keller is a geologist who studies the chemistry of volcanic rocks to learn how explosive a volcano is, how old it is, how deep the lava came from, and what that lava encountered on its way to the surface. Read the full text of Randy's interview below to learn more about his job. Hear Randy Keller talk about his job, volcanic rocks, and some of the tools used to study underwater volcanoes. Download (mp4, 30.3 MB). Assistant Professor. Most university faculty start out as an assistant professors and work their way up to associate professors after five to six years and eventually to full professors. Oregon State University in Corvallis, Oregon. Yes, once a month or so for scientific conferences, fieldwork, research cruises, and even an occasional vacation. Geology and oceanography are very international sciences. There is so much to learn from colleagues in other countries that I wish I could go to more scientific conferences to see what others are doing, but there is not enough time or money to go to every conference. I have been to every continent, camped out for two months at a time in Antarctica, and lived in Poland for a year and a half working with some colleagues there on volcanic rocks from Antarctica. A Ph.D. in geology, oceanography, or some related field is usually required for a university faculty position. That takes five years or more of graduate school, by which time you have either burned out or become addicted to posing and solving your own scientific questions. Many people go to graduate school in oceanography after majoring in chemistry or physics or biology, they just apply their skills to the ocean. The salary range is $40,000–$60,000 to start, and higher for associate professors and full professors who have been in the job for a while. I work 50–60 hours per week depending on deadlines and if I am teaching a class. That may sound like a lot, but I almost always have the freedom to choose the exact times I work. For example, I often have to work straight through a weekend to get a big project finished on time, but then I can take a couple of days off to recover if I want to. Or I can take an afternoon off if the weather is nice, but then I usually have to work late that night to catch up again. The working hours on research cruises can be pretty brutal; 12–18 hour days are typical, and sometimes it can get so busy that there is no time to sleep at all for a day or two. I specialize in the chemical composition of volcanic rocks because rock chemistry can tell you how explosive a volcano is, how old it is, how deep the lava came from, and what that lava encountered on its way to the surface. So when I go out on a ship or hike up a mountain to collect samples, I am only beginning my studies of an area. Many of the key answers come later when I return to the laboratories at my university and grind, dissolve, and melt the rocks to determine their chemical makeup. 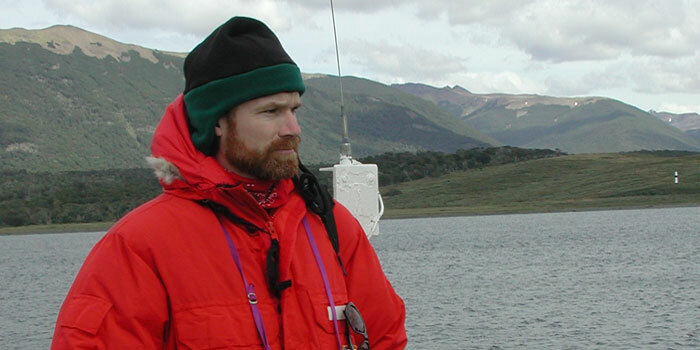 Many geologists live close to where they do their fieldwork, but I do not because I work mostly in the North Pacific Ocean and Antarctica, so I often have to leave home for one or two months to go out on a ship or fly to a research station in Antarctica. This is probably a toss up between watching bioluminescent organisms streak by the window in Alvin while descending through the deep dark ocean and watching lava flow down a hillside in Hawaii and then cool into solid rock before my eyes. Asking and answering my own questions about what shapes the Earth, what is found on the seafloor, and what we can learn about the history of a volcano from picking apart the clues left behind in the rocks. With a better understanding of volcanic eruptions, I think we can reduce the hazards created by volcanoes and also how volcanoes can affect our weather and climate. Underwater volcanoes, even the inactive ones, provide important habitats for a variety of marine life. One of the most interesting things to me about our seamount exploration cruises to the Gulf of Alaska is the way many types of marine organisms seem to prefer rocky instead of muddy areas of the seafloor, so even they care about the geology. Work as a consulting geologist on volcanic hazards, in environmental chemistry tackling issues such as mining pollution and groundwater safety, or as an interpreter at a national park with cool geology (Yellowstone or Grand Canyon, for example). I started out in geology because I was interested in the natural world and how beautiful features such as mountains and valleys formed. After taking a few geology classes in college, I realized that I was most interested in volcanic geology because it seems so active and exciting. When I moved to Oregon for graduate school, I took a few classes in oceanography that really opened my eyes to how little we know about the ocean floor. More than two-thirds of Earth’s surface is covered by oceans. There are so many unexplored parts of the ocean that it seems like there will always be new discoveries waiting to be made. My parents always encouraged me to follow my heart and pursue a career that I will enjoy. Also, I had some excellent geology and botany teachers in college that had such passion for discovering new things about the natural world and knew how to have fun at the same time, that I figured a natural science such as geology must be an interesting career. I might have given more consideration to a specialty that has more direct and obvious societal benefits, such as water resources or volcanic hazard mapping. I understand that the work I do forms an important piece of the puzzle for figuring out how volcanoes work, but sometimes I wish I was the one putting it all together, combining my own work with that of others to assemble the puzzle myself, perhaps saving lives or helping people find the water they need. Scientists are people, too, and some of them are a little territorial about where they work and do not like having others working in the same area. This would be a bigger problem for me if I worked in easily accessible parts of the U.S. or other developed countries because of the numerous other geologists also working there, but is not so much of a problem when I work in remote and sometimes inhospitable areas that many scientists prefer to avoid. Hiking, mountain biking, cross-country skiing, and traveling. Oregon is a great place to live if you love the outdoors. I used to sail and snorkel a lot when I lived in Florida, but the ocean is so cold in Oregon that I only admire it from a distance here! Do you have an inspirational message or quote? If you love to learn new things, are curious how the natural world works, and enjoy solving problems (even amazingly complex ones), then a career in science could be for you. It is an adventure to go new places and discover new things and to ask and answer your own questions about how the Earth works. Many things about the natural world: the ocean, mountains, plants, animals. Growing up in Miami I spent quite a bit of time sailing and swimming in the ocean. My interest in marine sciences really gelled after high school when I spent many weekends and evenings after work canoeing the mudflats and mangroves of South Florida. Marine geology class the first year of graduate school, although the biology class I took in junior college included some marine biology. The summer between undergraduate and graduate school I worked for the U.S. Geological Survey studying earthquakes in California. I learned that I was most interested in active processes such as earthquakes and volcanoes and that a large part of the effort in scientific work goes into planning and preparing for collecting the data you need to solve a problem or make new discoveries. I also learned that science can be fun! My first marine geology class in graduate school rekindled my interest in the oceans and I wanted to learn everything I could about how they formed and how they work. We know so little about the oceans and they cover so much of our planet, how can there not be exciting discoveries still to come? Gulf of Alaska - Seamounts in the Eastern Gulf of Alaska: A Volcanic Hotspot with a Twist?